Having carried all before them in their four previous games this season, Hartpury needed to show new levels of grit and determination to take all five points from this intense clash in the Midlands. Indeed, with less than 10 minutes to play they found themselves trailing in a game for the first time in the current campaign, before a late show of resolve got them over the line. Anything other than a Hartpury win would have been a miscarriage of justice, but that seemed the likely outcome when the visitors, reduced to thirteen men by yellow cards, surrendered the lead by conceding two quick tries midway through the final quarter. A miserable morning had finally given way to autumn sunshine by the time kick off arrived, with Hartpury showing a number of changes from last week’s romp at home to Fylde. Rhys Oakley, Joe Dancer and Mat Gilbert were all restored to the starting forward pack, while Jonas Mikalcius was back from injury on the wing. Adam Hastings was required by his parent club, Bath, meaning that Jacob Perry was back in the 10 shirt. 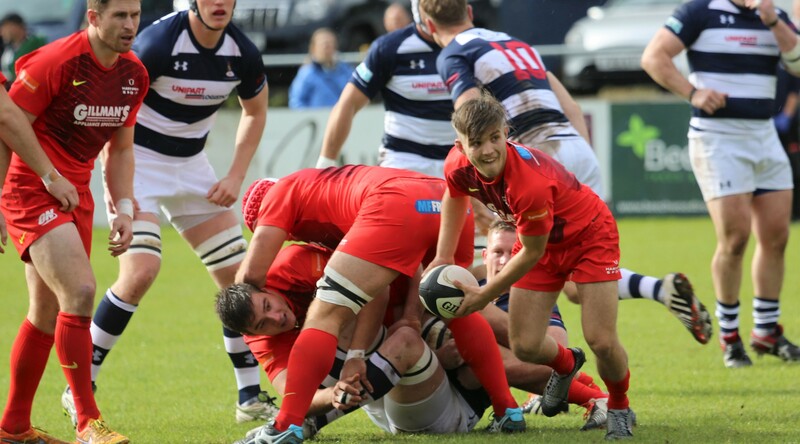 But it was young scrum half, Harry Randall (pictured), already a Junior World Championship winner with England, who caught the eye with a performance that included Hartpury’s first and last tries of the match, coming at either end of this pulsating encounter. Games between these two sides have been close each time they have met and this was to be no exception although, from Hartpury’s opening quarter, followers might have anticipated a more comfortable afternoon. They were on the board quickly thanks to the smart thinking of Randall. Coventry were penalised in their own half and the young Gloucester scrum-half had the confidence and vision to opt for the tap and go. Barely a hand was laid on him as he danced through at pace from 30 metres for a try easily converted by Perry. Will Maisey did land a kick for the hosts shortly afterwards but Hartpury extended their lead when Steve Leonard picked his way through some indifferent Coventry tackling to make it 12-3. The remainder of the half was somewhat frustrating for the College who dominated in terms of possession and territory without being able to find the space needed to stretch their advantage. Meanwhile, Maisey kept them honest with a couple of long-range penalties, including one on the stroke of half-time, which had Coventry back to within three points at the break. The second period started much as the first had finished, with Hartpury on the offensive, although they did lose incisive full-back Mike Wilcox with only a couple of minutes played, after he collected a knock challenging for a ball in the air. His replacement was flyer Harry Cochrane and it was he, after a good midfield break engineered by Mikalcius and centre Luke Eves, who took Hartpury deep into home territory. Cochrane was eventually pulled down 10 metres short but good support from open-side Mat Gilbert kept the momentum and, when the ball was eventually spun left, Mikalcius was back on his wing to celebrate his return with a fine team try. Coventry needed to respond and they did, with a series of attacking scrums in the Hartpury 22. The Midlanders have a powerful pack and were happy to try and take advantage at the set piece. Hartpury appeared to be scrummaging well but, with the home crowd baying for a penalty try, both Wayne Thompson and Des Merrey saw yellow at successive scrums. Ironically, this appeared to work in Hartpury’s favour, as the loss of the two Hartpury props meant that the game went to uncontested scrums. But the two-man advantage was soon to tell. An overthrown defensive line-out was all the invitation that Coventry needed to get replacement winger Rob Knox in at the corner and only another four minutes had passed before an overlap on the other side of pitch saw lock Tom Jubb rumble over. Maisey did well to convert both scores and, at 23-17, the home crowd were beginning to celebrate an unlikely win. But, with numerical parity restored, Hartpury launched a series of powerful drives towards the home line and after the forwards had gone close it was Randall who darted over to score, allowing Perry to regain the lead with the extras. Coventry were deflated and Perry soon had the opportunity to stretch the lead to four points with a penalty won at the breakdown, before missing another with the final kick of the match. The result keeps Hartpury’s perfect start intact, and they will be hoping for more of the same when Hull Ionians visit Gloucestershire next weekend. The other unbeaten team, as of yesterday morning, are unbeaten no longer – Moseley were defeated at Ampthill in the other stand-out match of the day. Two sides managed their first wins of the season – Rosslyn Park saw off Darlington Mowden Park in Roehampton, while Fylde had just enough to overcome visitors Esher. Blaydon are still looking for their first ‘W’ but at least they didn’t lose, their game with Macclesfield ending 24-24. Plymouth Albion and Blackheath both stay in the leading pack, with wins over Old Albanian and Hull Ionians respectively. Loughborough Students gave up and handy lead at Cambridge, eventually going down 35-34 to some late scores in what sounds like a corker. Next Saturday’s fixture with Ionians kicks off at 2.30pm and all support is most welcome. Coventry: Stokes, Hircock, Fenner, MacBurnie, Rundle, Maisey (Cons 69, 74; Pens 9, 18, 40), Adamson; Brown, Tolmie, Boulton, Jubb (Try 74), Poole, Daynes, Harry, Grace. Replacements: Price, Stankovich, Dyer, Smit, Knox (Try 69). Hartpury: Wilcox, Boulton, Leonard (Try 13), Eves, Mikalcius (Try 51), Perry (Cons 3, 78; Pen 80), Randall (Tries 2, 78); Flook, Tanner, Thompson, Oakley, Dancer, Polledri, Gilbert, Safe. Replacements: Stephenson, Merrey, Brockett, Quinn, Cochrane.